Disasters can be defined as a natural or human-made event that leads to large-scale destruction of life and property resulting in permanent changes to human society and environment and untold suffering which require extraordinary response usually from outside the affected area. The term MCI refers to disasters that involve many people., The frequency of disasters and MCIs is increasing, and calamities always involve mass casualties because they are unpredictable. According to UN report, from 1994 to 2005, the world witnessed over 67,000 deaths and 260 million people wounded yearly due to disasters. An estimated loss of U$204 billion occurred due to natural disasters in the 1980s. Disasters and MCIs consume local resources in the short-term and long-term, and therefore, appropriate preparation is required to avoid high death and failure rates in such cases. Recurrent industrial action across all sectors of the economy is a major problem in Nigeria over the years. The health sector has witnessed its own share of industrial disharmony and recurrent strike actions. The Nigerian public hospitals had been repeatedly shut down in the past 4 years due to industrial actions by health workers leaving patients and victims with no other options than to seek for an alternative. With the emergence of Boko Haram sect, there were series of terrorists' attacks when either the Doctors or other health-care providers were on strikes. The lack of functioning disaster team which coordinates activities as well as lack of any special training or rehearsals on handling disaster in the majority of public hospitals in recent past has made the management of MCI a big challenge. The day of 28th November 2014 witnessed one of the major suicide bombings in Kano, Nigeria, targeting the public in Friday prayer grounds within the densely populated ancient city of Kano. The multiple bomb explosions and shootings resulted in one of the biggest MCI ever recorded in the city. There were about 500 dead and more than 1000 injured victims according to an official report. This was preceded by a similar attack on the general public in January 2012, after many of such attacks in the North-Eastern cities of Nigeria. There was an industrial actions by the joint health staff union in the biggest federal teaching hospital in the state capital, where services were virtually non-functioning, this lead to some Samaritan to take victims to the state hospitals where either or both the trained personnel and facilities to handle disaster were not available. Not until after about 3 h of negotiation with the union leaders to allow their members to cooperate after which the announcement of opening the teaching hospital casualty was made, and patients/victims were rushed. This study aimed at determining the types of injuries, location, severity and time of presentation, as well as a presentation to intervention interval. It also assesses the challenges encountered. We retrospectively reviewed the records of all victims of suicide bombing and weapon shooting who were admitted at Aminu Kano Teaching Hospital, Kano, on Friday 28th November 2014. The management protocol highlighted that each admitted patient was delegated to a resident surgeon and an anaesthesiologist/Intensive Care Unit resident who accompanied the patient throughout the initial evaluation and into the operating room if required. Every 3–4 patients were assigned an attending surgeon who supervised the process of triage and the initial evaluation and treatment. Medical students on surgical postings were mobilised to help in records, and minor procedures such as catheterisation, distribution of drugs and intravenous access. Data were retrieved from medical records. The charts of all patients admitted to the hospital with the diagnosis of trauma were reviewed and demographic data such as gender, age, ethnic group, occupation, the cause of trauma and types of injuries and their location as well as severity. Time of presentation after the injury was also noted. The records database was screened for patients who had physical injuries and were admitted to the hospital following the Friday mosque attacks. Data were entered into Microsoft excel spreadsheet and then exported into SPSS Version 16 (University of Bristol Information Services, UK, October, 2008) for Windows for analysis. Qualitative variables were summarised using frequency and percentage while quantitative variables were summarised using mean and standard deviation or median range as the case may be. There were a total of 194 patients who presented to the accident and emergency unit of the hospital, 20 (10%) were dead on arrival, 37 (20%) had major injuries, while the remaining 137 (70%) had minor injuries and were treated and discharged on the day of the presentation. The available records that were analysed were for the 37 who had major injuries. The mean age of the patients was 33.4 ± 19.25 years, whereas the age group is depicted in [Table 1]. More than half of the victims are in the age group of 21–40, while about a quarter is in the range of 0–20. Least is the group of 81–100 years. The victims were all males, Muslims and Hausa/Fulanis. The mean time of arrival to the hospital in hours was 2.7 ± 0.96 h. [Figure 1] shows the distribution of the time of arrival of the victims to our facility. More than half presented within 3 h while about 40% were brought within 2 h. Least was those brought at 1 and 5 h.
The time of surgical intervention after arrival to the emergency room is shown [Table 2]. More than half of the victims were operated within 6 h of presentation. 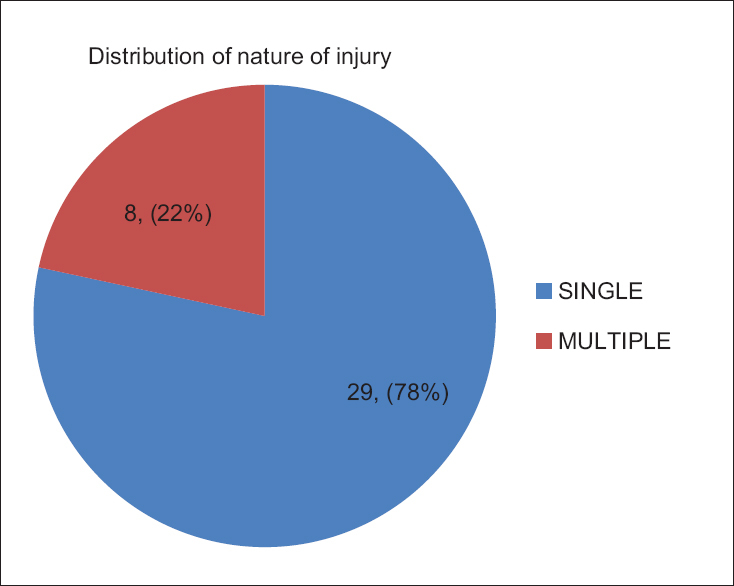 The distribution of the nature of injuries based on a number of systems involved is shown in [Figure 2]. About 78% had single system injuries while 22% had multiple organ system injuries. 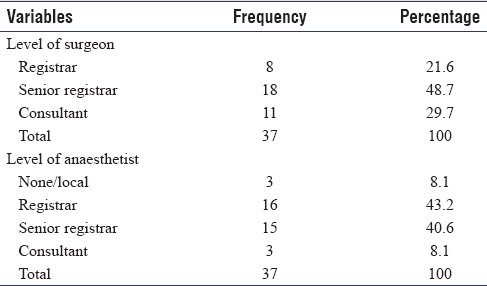 [Table 3] shows the level of the intervening surgeons and anaesthetists. 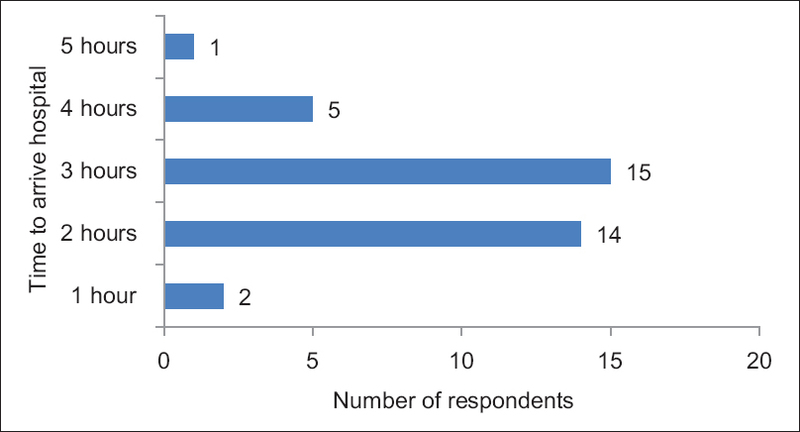 About 30% of interventions were by consultants, 49% by senior registrars while the rest were by registrars. About 9% were performed by consultants, 41% by senior registrars while almost half were by registrars. Those with minor injuries required only local anaesthesia and were given by the operating surgeons. Majority of the patients did not require a blood transfusion. About a quarter of had at least one pint transfused each as depicted in [Table 4]. Musculoskeletal was most commonly affected, accounting for 62% of the cases, this was followed by the abdomen (14%) as shown in [Table 4]. The types of surgical intervention performed are shown in [Table 5]. Out of the 37 patients that were managed by surgical intervention, only one (2.7%) died, the majority of the (89%) did well and were discharged without permanent disability. The outcome was generally good. The mean age was 33.41 ± 19.25. Majority of victims were in the age groups of 0–60 years, indicating the young to middle age being the bulkiest of our population and more likely to attend prayer grounds, and in keeping with the median age of 35 years of victims of Jakarta bomb blast as reported by Chim et al.,,, The age groups are wide because it cuts across all the age groups from a minimum of 4 years to a maximum of 81 years. This may be because all age groups attend Friday prayers according to Islamic rights. We found all the victims to be males and belong to Hausa/Fulani tribe as is typical of Kano metropolitan city and their religion is Islam in keeping with the mosque attack. There were no collateral victims among passer-by as usually non-Muslim avoid the roots due to traffic during prayer times. The mean time of arrival at the casualty room of our institution from the time of the blast was 2.730 ± 0.962 in hours. The hospital is located about 12 km from the scene of the attacks. The delays can be explained by the presence of a specialist hospital within 2 km, where victims would be rushed at first and only to come to the teaching hospital on spillage or referral from there. Moreover also the knowledge that there was an ongoing strike action of joint health workers around the time. We triaged the victims based on the general physical conditions such as external bleeding, vital signs and a patient is assigned to a group of medical workers for immediate further assessment and preparation for surgery and those considered stable by the head of triage will be in the waiting area, until any of the teams is less busy enough to review again or attention is called by the severity of pains or routine reassessment. Within 3 h of presentation, 1 (2.70%) had his intervention done. 11 (29.73%) had their initial treatments within 6 h of presentation. A further 13 (35.14%) were within 12 h. The remaining 13 (32.3%) where operated from 24 to 72 h after the presentation. Although, there is no specific trauma and mass casualty practical training of health workers as in other centres  and obvious lack of emergency preparedness training  which we ought to have had with the coming of insurgency in northern Nigeria, there was high willingness among faculties, residents and other health workers  which led to immediate care to the victims. The reasons for the delay in the last 32% was either due to undertriage or patients who were initially thought to be stable but only to deteriorate on observation and not due to inadequate workforce or resources. About 29 (78.38%) of the victims sustained single system injuries, whereas 8 (21.62%) have multiple systems involved in injuries. Sustaining multiple system injury is more typical of gunshot injuries and blasts as found to 62% in the explosion and 47% of gunshot injuries. We did not classify the victims based on the mechanism of injury, but the low level of those who sustained multiple injuries to our centre could be explained by the possibility of those with multiple injuries dying at the scene or being rushed to the closest hospitals and likely to receive early attention on triage due to the multiplicity of the injury. There was serious dedication and willingness by the Hospital staff to attain to the victims, sufficient hands including faculties, residents, medical students and other health staff with 5 h before the arrival of the victims. Although we did not count the number of personnel mobilised and the exact time they arrived as reported by Shen et al. where 10,630 medical workers were activated within 2 h, but the percentages of the victims treated by different levels of surgeons and anaesthetists hold to that. Eight victims (29.73%) were operated by faculty surgeons, 18 (48.65%) operated by senior registrars and 11 (21.62%) were by registrars. Victims of blast and shootings usually sustained a various degree of injuries with some suffering combination of blast, penetrating missiles and shrapnel, blunt and burns injury and that usually require more abdominal, vascular and neurosurgical procedures compared with other forms of trauma and as well most intentional blasts tend to cause more severe injury. The distribution of injuries shows a higher distribution when compared to 51.6% extremities, 24.5% torso (chest, abdomen, trunk and pelvis) and 21.8% head and neck as reported by Boonthep et al. However, almost closely similar to what was obtained in Jos, Nigeria during the 2001 mass casualty according to Ozoilo et al. Majority of victims closed to the blast died instantly or on their way to the hospital, which in our environment is hardly recorded, but for those who reached the hospital and survived to our intervention, majority 19 (51.36%) had penetrating gunshot or shrapnel injury followed by blunt injuries 10 (27.02%) and burns of varying degrees 8 (21.62%), unlike 52.2% and 41.4% who sustained injuries from gunshot and attack by matches and knives, respectively. There were various interventions provided based on the multiplicity of injuries. Up to 8 (19.05%) had exploratory laparotomies, 4 (9.52%) thoracotomies and 2 (4.76%) craniotomies, 3 (7.14%) had fracture reduction with or without fixation. Twenty-five (59.52%) had other interventions including enucleating an eye, maxillary fracture wiring, neck exploration and removal of shrapnel and indicated bullets. The injuries were, however, not mutually exclusive. Only 4 (10.81%) had laparotomy alone, whereas 2 (5.41%) had a combination of laparotomy and thoracotomy and 2 (5.41%) others had laparotomy and fracture fixation. 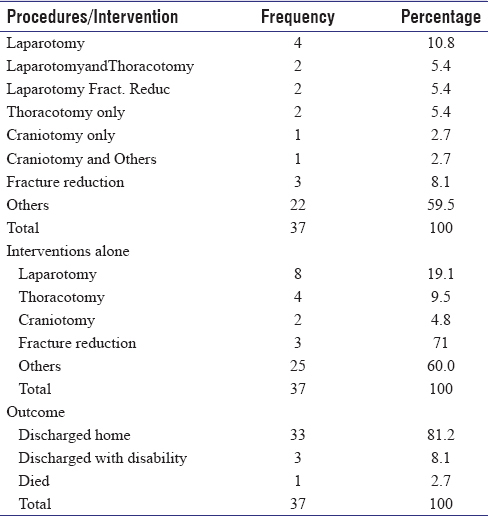 Thoracotomy alone constitutes 5.41% of the total intervention while craniotomy alone was 2.71%. Fracture reduction and fixation alone forms 8.11% while others exclusively form 59.46%. The pattern of these injuries based on its multiplicity and distribution on the parts of the body involved are in keeping with mass casualty incidences reported by Sylvain in Rwanda and Chad conflicts. The outcome of our intervention was impressive, apart from those who died on arrival before anything could be done, only one victim (2.70%) died after surgery. He suffered multiple injuries including facial, head and ocular injuries. Up to 89.19% were discharged home after successful treatment, whereas 8.11% were discharged with some disabilities. One of the victims was referred most probably due to proximity and our ability to provide all the needed care. We did not take into consideration the duration of stay in the hospital; usually, because a separate ward was provided and it did not interfere with our routine clinical work or available bed space and all resources for their treatments were paid by the government. Unlike what Peleg described in the outcome and characteristics of Israel terror-related injuries. We did not grade the severity of injury based on an acceptable formula. Drills for disaster management should be introduced and sustained. Despite the industrial actions which delayed victims from coming to our facility and subsequent intervention, we were able to operate Up to 30% within the first 6 h of presentation. We would have done better, and the outcome would have been much better if there were not any of such disharmonies. Huber-Wagner S, Lefering R, Kay MV, Stegmaier J, Khalil PN, Paul AO, et al. Duration and predictors of emergency surgical operations – Basis for medical management of mass casualty incidents. Eur J Med Res 2009;14:532-40. Gomez D, Haas B, Ahmed N, Tien H, Nathens A. Disaster preparedness of Canadian trauma centres: The perspective of medical directors of trauma. Can J Surg 2011;54:9-16. Culley JM, Svendsen E. A review of the literature on the validity of mass casualty triage systems with a focus on chemical exposures. Am J Disaster Med 2014;9:137-50. Lampi M, Vikström T, Jonson CO. Triage performance of Swedish physicians using the ATLS algorithm in a simulated mass casualty incident: A prospective cross-sectional survey. Scand J Trauma Resusc Emerg Med 2013;21:90. Kim SJ, Kim CH, Shin SD, Lee SC, Park JO, Sung J, et al. Incidence and mortality rates of disasters and mass casualty incidents in Korea: A population-based cross-sectional study, 2000-2009. J Korean Med Sci 2013;28:658-66.
International Federation of Red Cross and Red Crescent Societies. World Disaster Report: International Federation of the Red Cross and the Red Crescent Societies: 2001-2004. Available from: http://www.ifrc.org/en/publications-and-reports/world-disasters-report. [Last accessed on 2017 Jan 08]. Centre for Research on the Epidemiology of Disasters. Annual Statistical Review: Numbers and Trends 2010 CRED: Brussels 2011. Available from: http://www.cred.be/publications. [Last accessed on 2016 Oct 10]. Lemonick DM. Bombings and blasts injuries: A primer for physicians. Am J Comput Math 2011;3:134-40. Aylwin CJ, König TC, Brennan NW, Shirley PJ, Davies G, Walsh MS, et al. Reduction in critical mortality in urban mass casualty incidents: Analysis of triage, surge, and resource use after the London bombings on July 7, 2005. Lancet 2006;368:2219-25. Garner A. Documentation and tagging of casualties in multiple casualty incidents. Emerg Med (Fremantle) 2003;15:475-9. Ashkenazi I, Kessel B, Olsha O, Khashan T, Oren M, Haspel J, et al. Defining the problem, main objective, and strategies of medical management in mass-casualty incidents caused by terrorist events. Prehosp Disaster Med 2008;23:82-9. Hogan DE, Brown T. Utility of vital signs in mass casualty-disaster triage. West J Emerg Med 2014;15:732-5. Thompson J, Rehn M, Lossius HM, Lockey D. Risks to emergency medical responders at terrorist incidents: A narrative review of the medical literature. Crit Care 2014;18:521. Hamele M, Poss WB, Sweney J. Disaster preparedness, pediatric considerations in primary blast injury, chemical, and biological terrorism. World J Crit Care Med 2014;3:15-23. Chim H, Yew WS, Song C. Managing burn victims of suicide bombing attacks: Outcomes, lessons learnt, and changes made from three attacks in Indonesia. Crit Care 2007;11:R15. 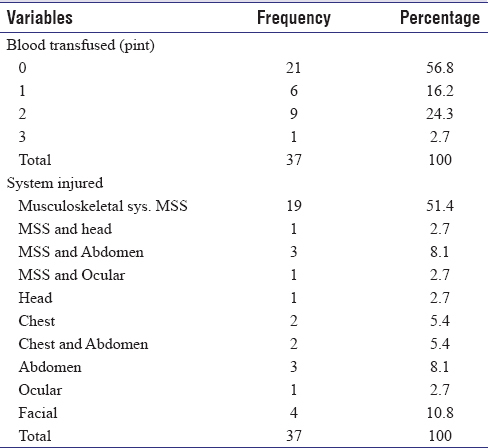 Wolfson N. Orthopaedic triage during natural disasters and mass casualties: Do scoring systems matter? Int Orthop 2013;37:1439-41. Massey T, Gao T. Mobile health systems that optimize resources in emergency response situations. AMIA Annu Symp Proc 2010;2010:502-6. Wolf P, Bigalke M, Graf BM, Birkholz T, Dittmar MS. Evaluation of a novel algorithm for primary mass casualty triage by paramedics in a physician manned EMS system: A dummy based trial. Scand J Trauma Resusc Emerg Med 2014;22:50. Abrahamsen HB. How to improve situation assessment and decision-making in a simulated mass casualty incident by using an unmanned aerial vehicle. Scand J Trauma Resusc Emerg Med 2014;22:2. Scott LA, Swartzentruber DA, Davis CA, Maddux PT, Schnellman J, Wahlquist AE, et al. Competency in chaos: Lifesaving performance of care providers utilizing a competency-based, multi-actor emergency preparedness training curriculum. Prehosp Disaster Med 2013;28:322-33. Snipes C, Miramonti C, Chisholm C, Chisholm R. Reporting for duty during mass casualty events: A survey of factors influencing emergency medicine physicians. J Grad Med Educ 2013;5:417-26. Peleg K, Aharonson-Daniel L, Stein M, Michaelson M, Kluger Y, Simon D, et al. Gunshot and explosion injuries: Characteristics, outcomes, and implications for care of terror-related injuries in Israel. Ann Surg 2004;239:311-8. Shen WF, Jiang LB, Jiang GY, Zhang M, Ma YF, He XJ, et al. Development of the science of mass casualty incident management: Reflection on the medical response to the Wenchuan earthquake and Hangzhou bus fire. J Zhejiang Univ Sci B 2014;15:1072-80. Bala M, Willner D, Keidar A, Rivkind AI, Bdolah-Abram T, Almogy G, et al. Indicators of the need for ICU admission following suicide bombing attacks. Scand J Trauma Resusc Emerg Med 2012;20:19. Boonthep N, Intharachat S, Iemsomboon T. Factors influencing injury severity score regarding Thai military personnel injured in mass casualty incident April 10, 2010: Lessons learned from armed conflict casualties: A retrospective study. BMC Emerg Med 2012;12:1. Ozoilo KN, Pam IC, Yiltok SJ, Ramyil AV, Nwadiaro HC. Challenges of the management of mass casualty: Lessons learned from the Jos crisis of 2001. World J Emerg Surg 2013;8:44. Rigal S, Pons F. Triage of mass casualties in war conditions: Realities and lessons learned. Int Orthop 2013;37:1433-8.